GitHub - Islandora/islandora_solution_pack_entities: This module is for adding support for entities (person, place, event, organization) to Islandora. This module is for adding support for entities (person, place, event, organization) to Islandora. Want to be notified of new releases in Islandora/islandora_solution_pack_entities? The link to the MADS transformation in foxmlToSolr.xslt must be uncommented. This will be either <xsl:include href="/usr/local/fedora/tomcat/webapps/fedoragsearch/WEB-INF/classes/fgsconfigFinal/index/FgsIndex/islandora_transforms/MADS_to_solr.xslt"/> or <xsl:include href="/usr/local/fedora/tomcat/webapps/fedoragsearch/WEB-INF/classes/config/index/FgsIndex/islandora_transforms/MADS_to_solr.xslt"/> depending on your installation. 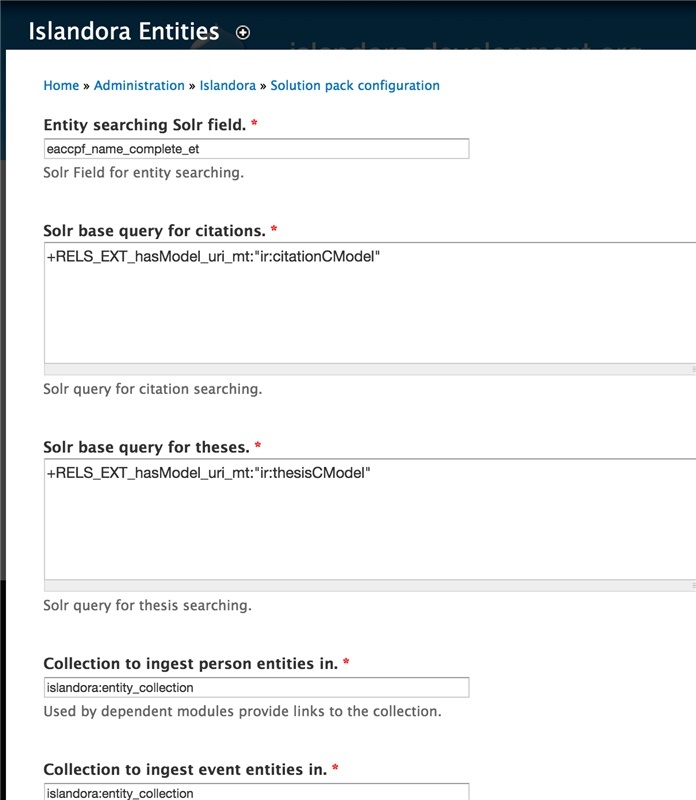 The Solr field for searching entities and the entity collection are configurable at Administration » Islandora » Solution pack configuration » Entities (admin/islandora/solution_pack_config/entities). Islandora Solr Metadata must be chosen as the default metadata display. This can be set at Administration » Islandora » Metadata Display (admin/islandora/metadata). Further documentation for this module is available at our wiki. If you would like to contribute to this module, please check out CONTRIBUTING.md. In addition, we have helpful Documentation for Developers info, as well as our Developers section on the Islandora.ca site.